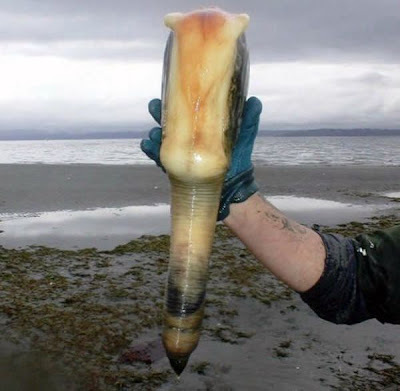 13 Above: World's Most Strange Species - Geoducks ! They are definitely not "ducks", nor do they have any relation to "geo"-logy. In fact, they seem alien enough to be "from Mars" and, for all I know, possess a malign intelligence. 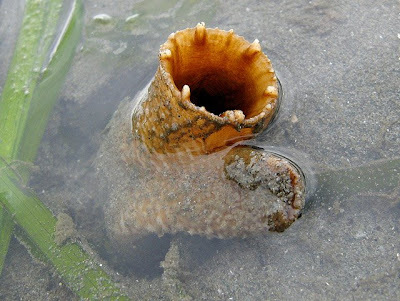 They are found mostly around Pacific Coast of the US and Canada, and in Japan they seem to serve as inspiration for "manga" of certain tentacled variety. 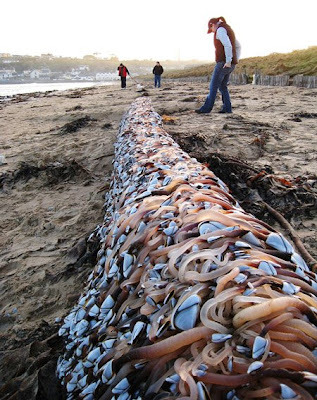 Modern biologists easily classify it as large saltwater clam, a bivalve mollusk with a huge "neck", or a "siphon". How huge, you'll ask? Up to two meters in length. Deep Diggers of the Depths : Even their name is wrong, because it's pronounced "GOOEY duck". You'd think an epithet "gooey" would seem more appropriate for this bizarre creature, but it's not gooey in any sense. The name comes from a misspelling of "gweduc" (a native word), which means to "dig deep". Also, the "Elephant Trunk Clam" monicker fits them quite well. You'd need to hook up with your buddy to dig them out, especially if you're going to use the "hold-breath" method. It's not so easy to spot the protruding siphon, either. Sometimes they are confused with "piddocks", which are smaller mollusks. But once spotted, they can't escape you, or dig further down. 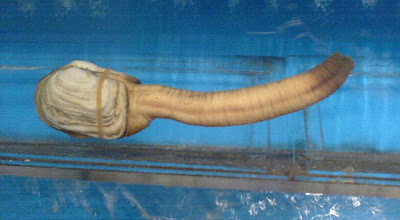 In fact, the body of an adult geoduck remains in one spot for its entire life. Sea stars would nibble at them, but once they bury themselves almost a meter deep, no predators can get at them - so they end up living REALLY long. Old and Wise : Treat them with respect. They'll outlive any of you - they get up to 160 years old . It's the second longest-living organism on Earth (after giant tortoises, which can live almost 200 years). As they grow, they accumulate rings on their shell, much like a tree does. 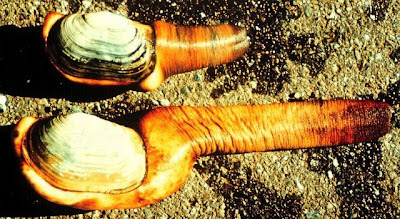 The average adult geoduck that you'll likely to meet will be the same age as you - 25 to 50 years old, but it hardly has the same experiences as you are, being buried all its life in one spot. 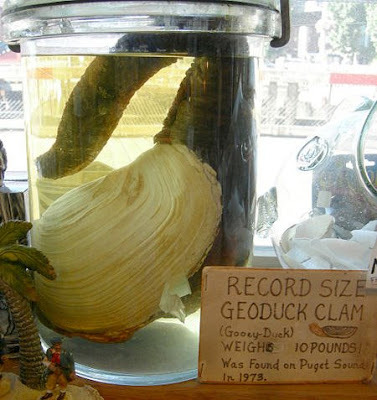 Here is a good-sized geoduck on display in a curiosity shop in Seattle. "Their large, meaty siphon are prized by some for its savory flavor and crunchy texture." 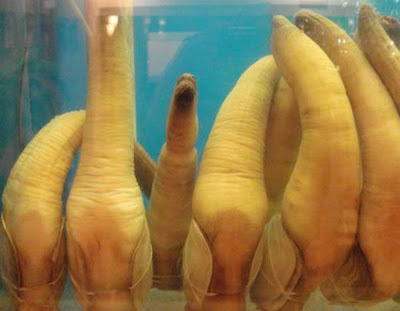 It is a delicacy in Asia, each costing $200 - $300, so if you ever considered opening a private geoduck farm... be also ready to deal with their reputation to increase the "male potential". The average female produces up to 5 billion eggs in her lifetime. Here is a picture of a bunch of geoduck-like mollusks clinging to a log of wood in Ardmore. 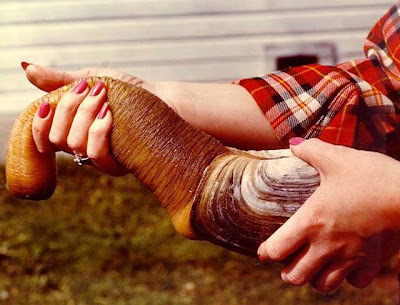 Geoduck is an official mascot for the Evergreen State College in Olympia, Washington - which also has a (very appropriate) motto. "Let It All Hang Out".